A major figure of the Beat Generation of artists working in California during the late 1950s and 1960s, Bruce Conner is a prolific artist who has worked with a variety of media including assemblage, collage, film, sculpture, painting and printmaking. Conner’s assemblages are made from cast-off pieces of furniture, found objects and other unconventional art materials. The narratives of his assemblages are often as raw and jarring as the materials he uses to make them and often incorporate blatant references to challenging social issues such as sexual pathology, war, death and human suffering. COUCH is among Conner’s notable macabre creations. This disturbing assemblage portrays a severed and decomposing wax figure lying on a decaying, paint-splattered settee. Although Conner stopped making assemblages in 1964, the powerful works he created during his formative years remain greatly influential. 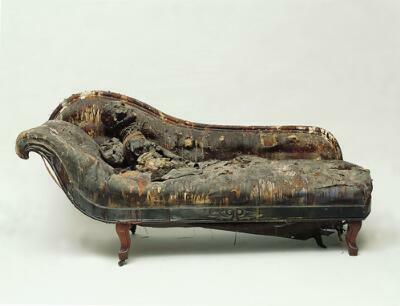 This piece by Bruce Conner, called COUCH, is impossible to ignore. There’s something gruesome about this apparently decomposing figure reclining on a torn and paint-spattered sofa. In any other setting, we would turn away in horror. Yet in a museum, we’re inescapably drawn to look. The sculpture is an example of assemblage, an art form in which found objects, wood, fabric or other materials are combined to create a three-dimensional piece. Assemblage was an important development in 20th century art, freeing artists from the confines of traditional media. It is particularly suited to personal and political expression, because unexpected combinations of everyday objects can evoke powerful reactions in the viewer. Conner has always resisted efforts to categorize and explain his art, because to do so limits its range of possible meanings. But we know that he was deeply affected by the turbulence of the mid-20th century, including the Cuban missile crisis and the assassination of President Kennedy. Some have read works like COUCH as probing the dark side of the American psyche and exposing the social ills of our time, including nuclear weapons, war, urban decay and violent crime. Conner was an important force in the assemblage movement on the west coast, but within a year of completing COUCH, he abandoned this approach. Instead, he pursued other forms of expression, including filmmaking, painting, printing and drawing—as well as activities that question the relation of an artist to his work, such as sending stand-ins to scheduled lectures and refusing to sign his work.